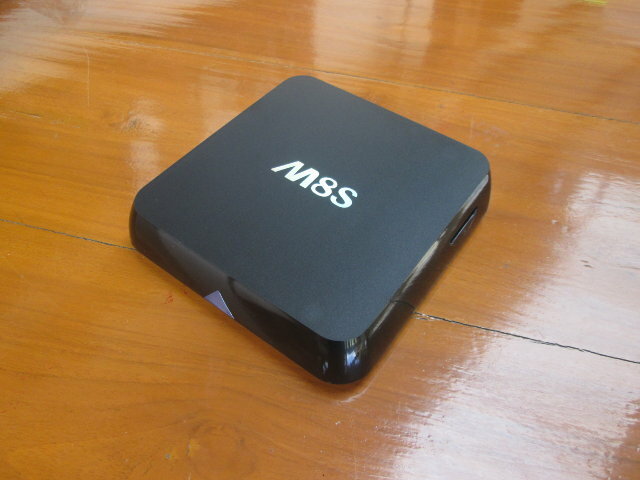 M8S and M8C Android TV boxes are updates of M8 / TM8 box, replacing Amlogic S802 quad core processor with Amlogic S812 processor which has about the same feature except it bring HEVC/H.265 hardware video decoding. M8S comes with 2GB RAM, whereas M8C features only 1GB RAM. Eny Technology decided to send me M8S for review. As usual, I’ll start with some pictures of the package, box, and board, and will do the full review in the next few days. 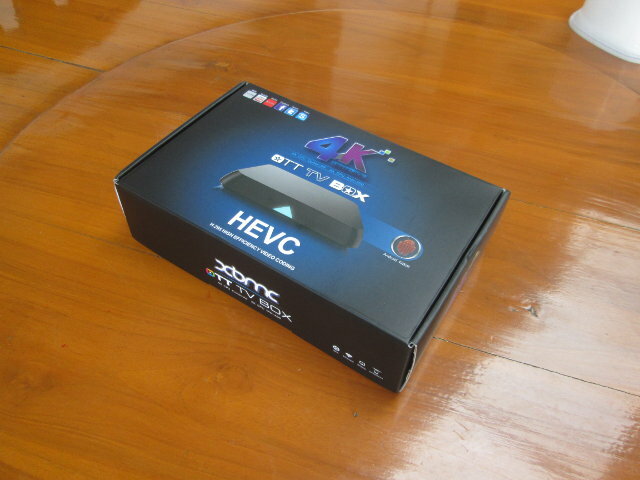 The company send me the parcel via DHL which I promptly received with the product in the package below marked “4K OTT TV BOX” and a predominant “HEVC”. The back of the package list the main specifications: quad core processor, octo core Mali 450 GPU, Android Kitkat. and so on. There’s also a sticker showing the MAC address, which starts with C4:4E:AC for those interested. The box comes with an IR remote control (requiring 2x AAA batteries), an HDMI cable (1.2m), a 5V/2A power supply, and a user’s manual in English and Chinese. As expected the box looks exactly the same as M8 / TM8 media player with the same front LED, and SD card slot on the side. 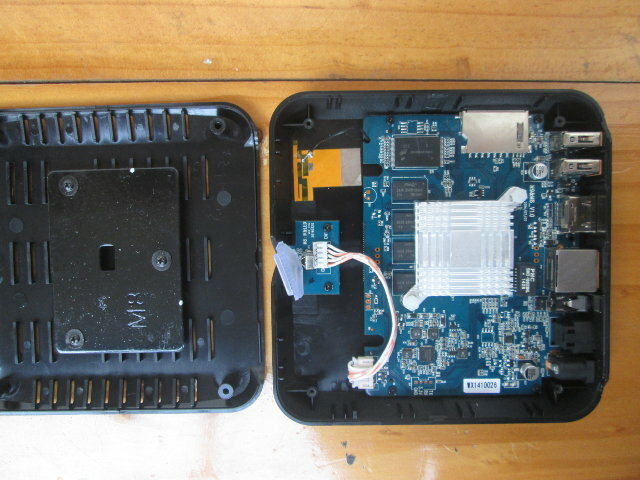 On the rear panel, the exact same connectors and placement can be seen with two USB host ports, an HDMI output, an Ethernet RJ45 port, AV output jack, optical SPDIF (that still feels low quality because of the plastic), and a power barrel. If you fancy watch an unboxing video instead, I’ve made one for you. We’ve already seen some pictures released by Eny Technology, but for the sake of it, and to have slightly sharper pictures, I’ve opened the box, and take a few more. To open the box it’s the same old same old method: remove sticky rubber pads on the bottom of the case, take out four screws, and pop the lid. The similarity with M8 are normally external, but components and connectors placement is exactly the same. Let’s remove four more screen to take the board out completely. The Wi-Fi module is AP6330 which supports dual band 802.11 b/g/n Wi-Fi and Bluetooth 4.0. 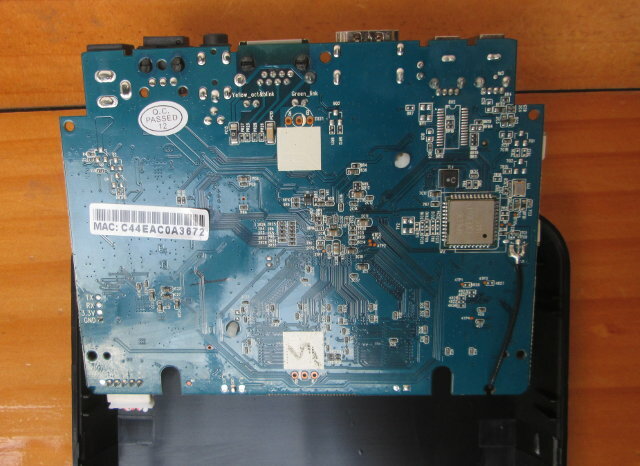 I’ve also removed the heatsink, and taken a closer picture of the top of the board. Oh surprise, it’s exactly the same PCB as Rippl-TV, namely M9&M8_V1.0 (2014/07/07), which is based on M8 hardware, but an updated version of the board compared to my earlier sample. Four Samsung K4B4G1646D DDR3L SDRAM chips are used to get 2GB RAM, MT 29F64G08CBABA NAND flash provides 8GB internal storage (so no eMMC in that device), and Ricoh RT618M PMIC handles the power. The recovery button is located right behind the AV port as usual. So basically, they’ve simply taken the last M8 PCB, and replaced Amlogic S802 with Amlogic S812. Eny Technology sent the M8S sample for review, and you could consider purchasing M8S or M8C from them if you are a resellers buying in quantities. Individuals can buy M8S for $87 and up on Aliexpress, and M8C (1GB RAM only) is starts at $75 including shipping. i presume still no gigabit there right? Nope. There’s one S805 or S812 device with Gigabit somewhere, I can’t remember which one. I wrote about it few days ago. could you try amlinux on this, when you will test it? So eMMC != nand flash? I am long time curious now, when you write AV port, is that the meaning for Audio/Video through the (S-video + Left + Right Audio) cable output, or is only stereo (Audio) output? I won’t test amlinux myself, but if somebody does it and release the image or/and instructions, I’ll surely post it here. AV port is usually composite + L/R audio. If not, I would refer to it as a headphone jack, or stereo audio out. As I told Pierre on my comments page, it will not work. Aside that S802 and S812 are pin to pin compatible chips, difference is in bootloader and kernel so who tries this will probably end with bricked device. I’ve postponed the review, as I’ve had too many problems so far. 4. I disconnect the power to recover (no power button), and now it’s just looping on the boot logo, as it can’t boot properly. But I’ll wait for a new firmware before testing further. good to know, i will wait before buying, maybe will stick with my first choice s802 M8. does this box support miracast (display & Source)? have you finally tested the device with a more stable firmware? Can you tell us something/do a review? I think the firmware took so long to be released, I have already given the box away. You said that you have an USB webcam connected. Did you test visioconference service like Skype or Hangout ? If it works, can you share the reference of the webcam, please ? Does somebody know if you can install a hardware switch to wake it up so I don’t have to pull the woer cable and plug it again? 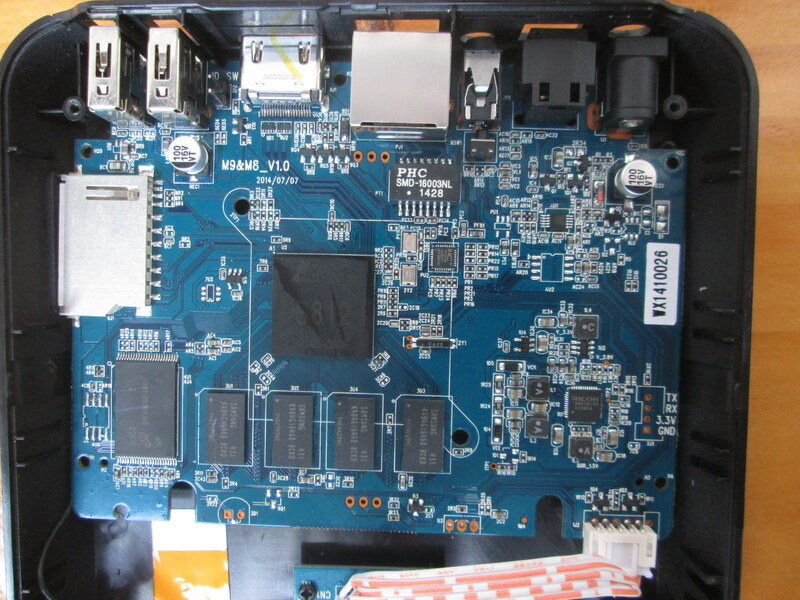 Or other hardware hacks on this device? Both M8S and M8S+ does not have an OTG port, so does anyone know how to flash these devices? Please do not purchase this product. It doesn’t work! this is a scam product. There is a very good reason the company doesn’t allow returns. Because everyone will want to return it after trying it. Save your self the head ache. Walk away from this one. I have a M8S with openelec on it, runs like a charm. One of the problems I have is when You put in a usb device. When You put it in to deep, then it’s like you make a short circuit and the device keeps on rebooting. If you pull the usb connector a little bit out again then it reboots fine and you can access the usb device. If you put in the usb device very gently the usb works as normal. Another minus for me is it doesn’t have a power switch, so I put a switch in the power cable. 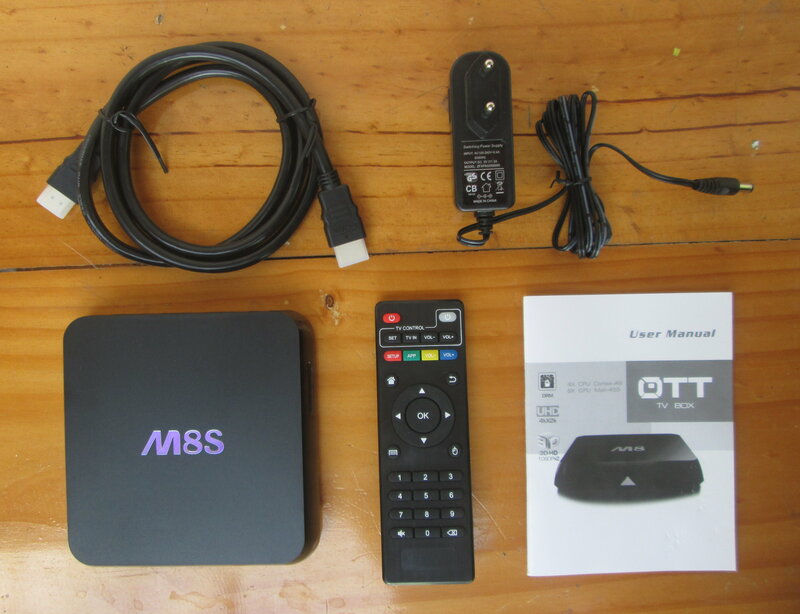 I have just purchased (2) M8S android boxes. One is for a digital tv and the other was for an analog TV. I’ve tested both boxes on the digital tv and both work fine via HDMI. I’ve tried both on the analog tv and they both do not work via the A/V port. I do have the correct yellow/red/white cable to connect. Is there a special technique to setup the box for an analog tv? There’s a setting in the menu to change the video output mode. You may want to connect both HDMI and AV, and change it to AV/CVBS (not sure how they call it exactly). Sometimes the connection of the cable don’t match the connection of the board. So Yellow may be red or white, red could be yellow or white, and so on. So you may have to connect red, white, and yellow in turn to the Yellow port on your TV to find out which one is really video composite. Thanks for your help! I tried everything you recommended. No luck. It DOES NOT give me an option for video output mode to switch from hdmi to analog. (even after connecting both sets of wires) I tried all options. I noticed on YOUTUBE videos that the M8 box was shipped with analog wires but the M8S was not. I feel like they know it doesn’t work, and that could be why they do not include the analog wire for an analog tv. What a joke! Choose resolution 480 (please disable auto) and use correct av cable (most cable will not fit, i mean regular cables will not fit, specially the yellow color section), then use remote to turn off and on. After restart it will show correct or no. One question: I have lost the power adapter, could you please say, what the box needs (electrical and mechanical – diameter)? And is the plus in or outside?